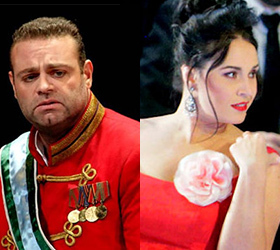 The Maltese tenor and Bulgarian soprano triumph in their explorations of the composer's more dramatic roles. ‘Salgo già del trono aurato’ is thrilling, even if the final top note spreads. She’s also a touching Leonora in Il trovatore…That slight burr in the tone that Eastern European sopranos produce and a fearless attack is much in evidence in arias from Stiffelio and Simon Boccanegra. What is missing here and elsewhere is any sense of character. Delivered on an appropriately grand scale, interpretatively the result is at best something special but at other times merely generic. The virtually constant loveliness of tone is a distinct plus, but conversely a sameness of approach leads diverse characters in quite different situations to end up sounding too much the same..
She rises to the challenges with almost audacious assurance, spitting out Abigaille's coloratura with venomous aplomb...It's hard to believe that this is a singer who specialised in baroque repertoire until not so long ago, but the voice has lost none of its flexibility and precision as it's taken on additional weight and colour...we're always conscious that both the music and the singer herself have a solid grounding in the bel canto tradition. She certainly has a go at just about everything, ranging from the delicacy of Desdemona’s ‘Ave Maria’, to the wilder grief of the Forza Leonora’s ‘Pace! Pace, mio Dio!’ Perhaps best are the musings of Amelia Boccanegra, which sit perfectly within the size and range of her voice. Massimo Zanetti’s conducting is spacious and supportive, and he makes much of the introductions to the Boccanegra and Don Carlo arias.